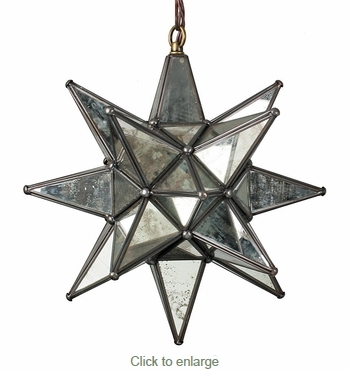 This small antique mirrored glass star light is a striking way to illuminate any room in your home. This authentic Mexican hanging star lamp was handcrafted by talented artisans in Mexico who adopted this Moravian tradition. These star light chandeliers complement any rustic or southwest decor and add an antique feel to your home decor.